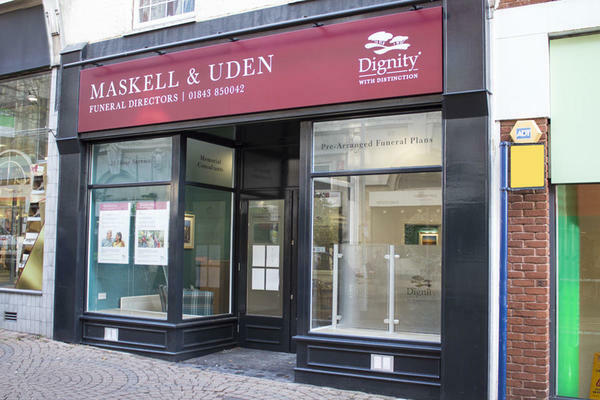 Everything we at Maskell & Uden Funeral Directors do, we do with kindness and integrity, with your wellbeing our first concern. Based in Ramsgate, we are here to help you with the arrangements for your loved one’s funeral. This will be an emotional time for you and we aim to do all we can to make it a little easier. You may be experiencing feelings of uncertainty, which are perfectly natural following the loss of somebody special. Our caring team of funeral directors will be available to help ease your concerns. You will be offered guidance and support throughout, as we help you shape a funeral that is both personal to you and a heartfelt reflection of your loved one’s life. From the moment you call, up to the funeral and beyond, it is your wishes that matter to us and we will endeavour to see them through. The ceremony can be tailored to your own preferences, so whether you want a religious or a humanist service, a traditional funeral or something a little more contemporary – a woodland burial, for instance – we at Maskell & Uden Funeral Directors will arrange it to suit. Our funeral home can be found on the High Street in Ramsgate’s town centre (opposite the Post Office), a location that places us at the heart of the community and within easy reach of other villages and towns in the Thanet and Dover districts. These include Birchington-on-Sea, Cliffsend, Eastry, Minster and Sandwich. We are available to call any time of the day or night and their will always be a sympathetic ear waiting to listen. If you feel you are ready to talk, get in touch. Call us today on 01843 850042 to talk through your personal requirements. We are located on the High Street, opposite the Post Office. Our staff are available 24 hours a day on 01843 850042 if you require our services outside of these hours. The service supplied by Maskells was sympathetic, informative, flexible and befitting the modern world. At the hub of this experience was Valerie who kept us fully updated and gave us suitable and relevant advice. Derek also was key to the smoothness of the funeral day also being flexible to the additional requirements of the family. Finally Peter the curate gave a first class service. Thank you for the kind comments posted on your online review. I am pleased that we provided the highest level of care and guidance for you and your family and that the arrangements for your Mother were carried out to your satisfaction. Very professional, compassionate and appropriately discreet.